Pictured below is a special low voltage disconnect controller designed to switch off an uninterruptible power supply (UPS) when the battery bank to which it is connected is low on charge. The system for which this controller was built is as follows. A 72V 2.3 kW solar PV array is connected to a 48V 50A MPPT solar charge controller. The charge controller charges a 48V battery bank (made up of an array of 12V batteries); and that feeds a 3.5 kW UPS which supplies electricity to the house. The UPS does not have a low voltage disconnect feature and so from time to time the batteries were being discharged too far. Obviously the owner wanted to avoid this as the battery bank is a very expensive part of the system. This particular UPS has a standard female USB port on it, and if its pin1 is shorted out with one of its other pins, the UPS switches off. 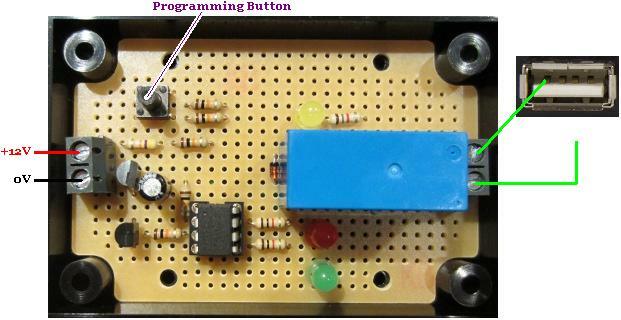 Therefore our controller is a slightly modified version of our standard programmable low voltage disconnect. One of the 12V batteries in the battery bank is constantly monitored. If the voltage measured stays below a user set low voltage threshold (e.g. 12.0V) for 10 seconds, the on board relay closes for 2 seconds which shorts two of pins in the USB socket and forces the UPS to switch off immediately. Therefore the battery bank is protected from being run down excessively. Pictured below is a controller designed to automate backup mains charging of a battery bank which is charged by an array of photovoltaic solar panels. 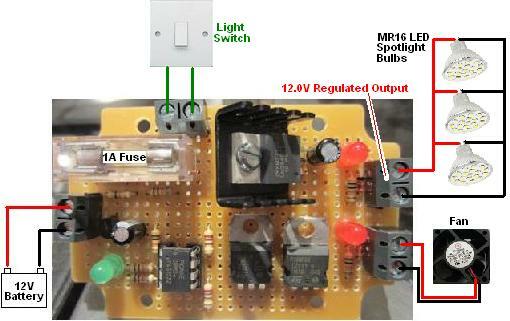 This controller is based around our low voltage disconnect products. 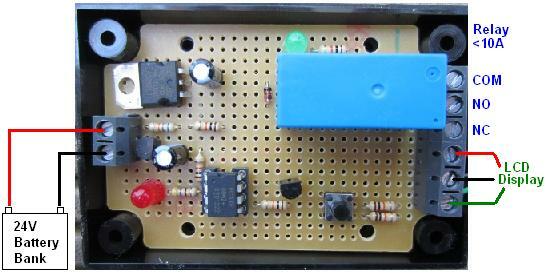 It constantly monitors the voltage of the battery bank. When the voltage falls below a user set low voltage (e.g. 12.0V), the on board relay closes which connects a mains powered battery charger to the battery bank. When the battery voltage then gets up to a user set high voltage (e.g. 13.6V), the on board relay opens which disconnects the battery charger. This controller is fitted with manual overrides so that the user can ‘override’ the controller and force the mains powered battery charger to come on when off, or turn off when on. This is very useful for a solar powered system since the battery bank voltage may be getting low and the weather forecast may also be bad for the coming day. In that scenario, it is worth charging up the battery bank fully immediately to prevent the battery bank from hanging around at a low voltage for an extended period of time (which is bad for battery longevity). Similarly, if the mains charger is on because the battery bank was low on charge, but the weather forecast is for non-stop sunshine, the override enables the charger to be turned off to leave the solar panels to do the rest of the work. If you need a controller like this, email neil@reuk.co.uk with details of your exact requirements. Pictured below is the connection diagram for a controller we have built to be used in a child’s playhouse. The playhouse will have a solar charged battery which will be used to supply power to three LED spotlights with a light switch, a small fan to circulate air and prevent the playhouse getting damp or too hot, and a dual cigar lighter socket with USB sockets which will be used to charge battery powered gadgets. As the playhouse will be used by children, safeguards have been fitted to prevent the battery from becoming excessively depleted and permanently damaged. In order to prevent the lights being left on and forgotten, when the light switch is turned on, a timer starts and if after one hour the light switch has not been turned off, the lights turn off automatically and will not turn back on until the light switch is toggled. The output from the controller to the LED lighting is regulated to 12.0V so that excessive voltage (particularly when the batteries are being charged) does not damage the voltage sensitive bulbs. To reduce power consumption, the fan which is used to ventilate the playhouse is turned on for just one hour every six hours automatically by the controller. The output to the fan is not regulated as the fan is rated for use with up to 18V, and if the battery voltage is high it is because there is or has been a lot of sunshine. Therefore the faster fan speed will prevent the playhouse getting too hot and stuffy. In order to prevent the battery from running too low on charge, an automatic low voltage disconnect is incorporated. When the battery voltage falls below 11.9V, the outputs to the fan and lighting turn off, and only turn back on again when the measured battery voltage exceeds 12.4V. The cigar lighter / USB socket is connected directly to the battery as the gadgets being charged by it will not draw much current for long if left connected since their batteries will get full and charging will stop automatically. If you need a controller such as this, or with any of the features it has, email neil@reuk.co.uk with details of your exact requirements. 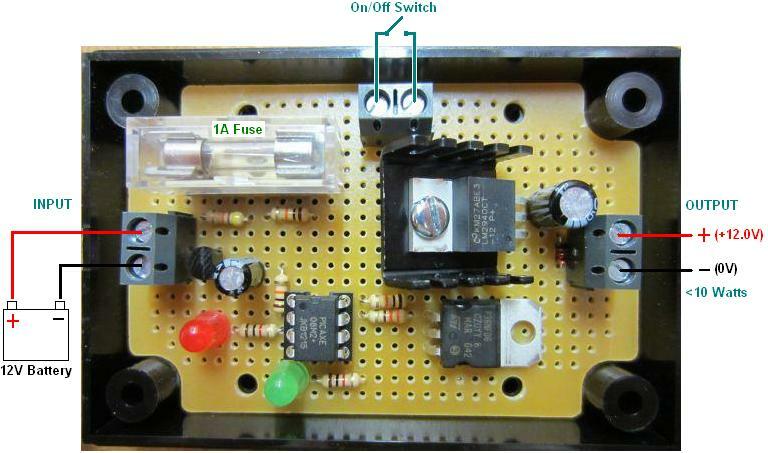 Pictured below is a low voltage disconnect circuit with two outputs. the battery does not get damaged by running too low on charge. If the measured voltage falls below 11.9V the output loads are switched off and not switched on again until the voltage is measured to be 12.5V or above. the LED lighting is not damaged by excessive voltage (>13V) – particularly important with solar powered lighting systems where battery voltage can get up to 15V. 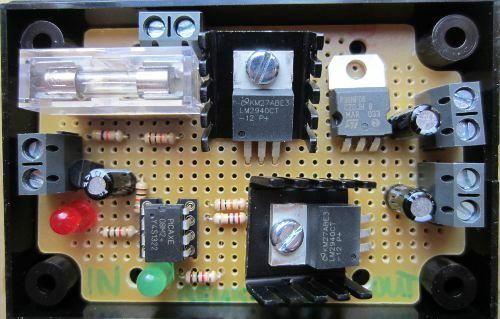 The pictured LVD/regulator is different in that it has dual outputs. The LM2940CT-12 voltage regulator is limited to around 1 Amp of output load, so our standard unit is not suitable in cases where the total LED lighting load exceeds around 8-10 Watts. Where the total load is more than around 2 Amps, we use an LT1084CP-12 regulator on the output side, but these are very expensive. Therefore where the LED lighting load is around 10-18 Watts, and can be split into a pair of separate lighting circuits, we simply make a double output regulator and split the load. If you need something along these lines, email neil@reuk.co.uk with details of your requirements. We have just finished working on a new low voltage disconnect project for a customer who supplies batteries and power inverters to consumers. Quite often his customers make complaints that the batteries have failed after a relatively short period of time, but he had no way of knowing if there was a problem with the battery or (more likely) a problem with the way the battery has been used and cared for. Pictured above is the low voltage disconnect with datalogger we made to solve this problem. The low voltage threshold at which the connected power inverter will be turned off, and the cancellation voltage at which it will be turned back on again can be set before installing the system. A low voltage of 22-24V is likely to be used and a cancellation of voltage of 24-26V for this 24V battery system. So that the treatment of the batteries can be assessed later, this controller has a built in datalogger. Every 12 hours it records the voltage measured on the connected batteries. Up to 200 data points can be stored in memory for a record of 100 days of activity. If more than 200 are collected then the earlier data points are over-written so that only the most recent 200 are stored. 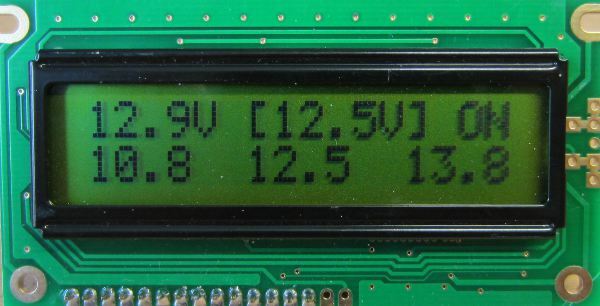 If/when the system is returned, an LCD display can be connected which enables the 200 data points to be stepped through from most recent to oldest, and a summary is also generated which displays how many times each voltage (from 1V to 35V) was recorded over the last 100 days. Using this data it is possible to see if the batteries were left uncharged for an extended period of time (very harmful to battery life), and how often they were run down to low charge levels (also bad for batteries). If you need a low voltage disconnect and/or a datalogger, contact neil@reuk.co.uk with details of your specific requirements. 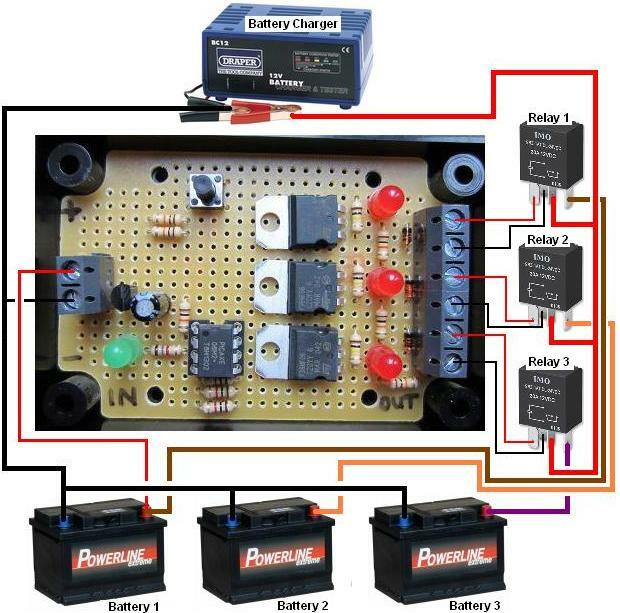 Today we completed a three way battery charger time controller for use in a motor home. This motor home has been fitted with three 12V batteries which are periodically independently used and charged (via a mains powered battery charger). In order to keep all three batteries well charged when at home or on a mains hook-up at a camp site, we made an automatic controller. This connects each of the batteries in turn to the charger, with the user able to programme in the charging duration required for each battery – e.g. 3 hours, or 5 hours etc. To make this controller more flexible we also added in a manual override enabling the user to manually select a battery to leave connected to the charger until they cancel the override – useful if one particular battery needs a lot of charging immediately. We fitted one red LED per battery to give a visual indication of which battery is currently being charged, and the green LED lights up when manual mode has been selected. The low current 12V outputs from our controller/timer go to the coils of three 25A automotive relays which switch the positive output from the mains powered charger to the appropriate battery. We have made hundreds of low voltage disconnects designed to protect batteries from being excessively discharged, but today we made a high voltage connect circuit. 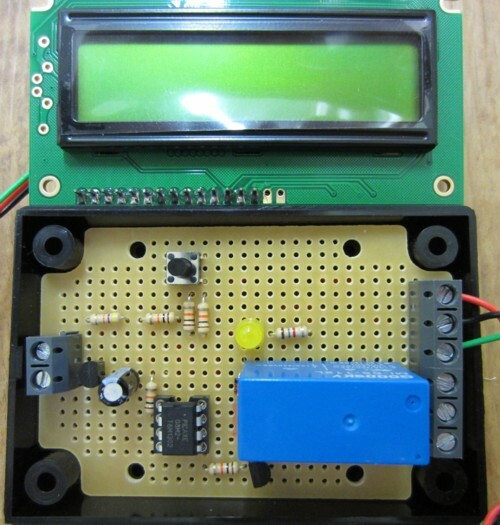 The requirement was for a device which will turn on a fridge when the battery voltage exceeds 12.2V and turn it off when the voltage falls below 11.8V, but with an LCD display and datalogging of the battery voltage. 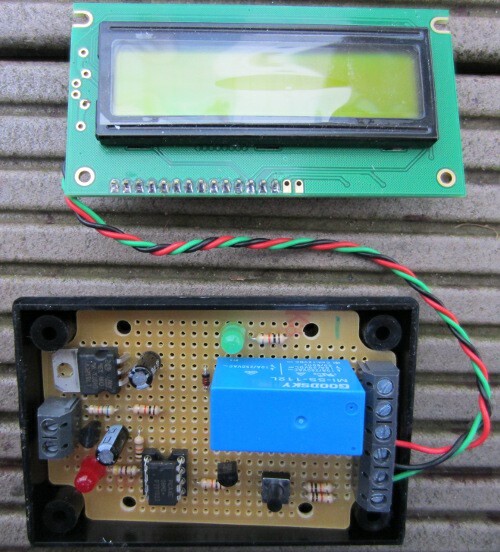 In our blog post Low Voltage Disconnect with Display and Datalogger we gave details of how we put together an LVD with display and datalogger. In this case the powered device(s) are turned off when the voltage gets too low, and only turn back on when it gets above a certain level. A high voltage connect only differs in how it responds when initially powered. On start up, a high voltage connect circuit will only supply power to the output device(s) if the voltage is above the user set high voltage threshold; whereas a low voltage disconnect will only supply voltage to the output device(s) if the voltage is above the user set low voltage threshold. Other than that, both devices behave identically. A high voltage connect circuit is functionally identical to a dump load circuit. With this high voltage connect we incorporated an LCD display and datalogger. The datalogger stores the last 200 battery voltage readings – one every seven and a bit minutes so that the previous 24 hours of battery voltage are logged. The display shows the current battery voltage and state of the system together with the minimum, maximum, and average voltage measured over the previous 24 hours. We will soon be adding programmable low voltage disconnect / high voltage connect circuits with displays and datalogging to the REUK Shop. In the meantime, if you need something similar to this email neil@reuk.co.uk with details of your exact requirements. Pictured below is our new 12V regulator with integrated Low Voltage Disconnect (LVD) battery protection for LED lighting applications. 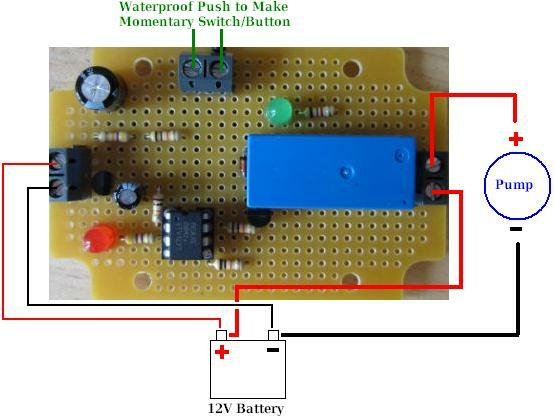 This device will supply power to up to 10 Watts of LED lighting at a safe voltage when connected to a 12V battery while at the same time protecting the battery from being excessively discharged and therefore having its lifespan reduced. It is a combination of our established 12V regulator and low voltage disconnect technologies. 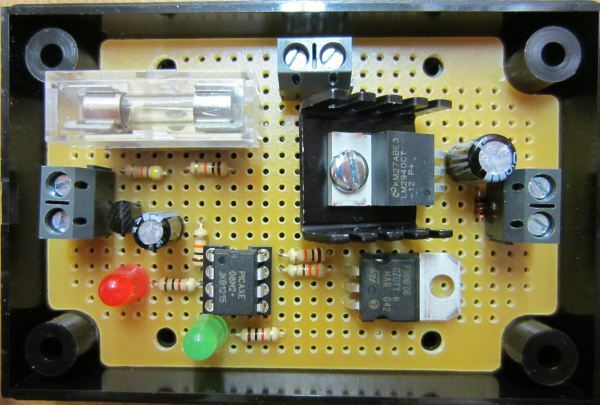 We currently only have this item for sale here: 12V regulator with LVD, but we will be adding it to the REUK Shop soon. Today’s project was a very particular low voltage disconnect for a powered snorkel system for recreational divers. The diver’s face mask is connected to a 5 metre long hose which is in turn connected to a buoy floating on the surface. A 12V battery powered diaphragm pump forces air from the surface down to the diver to breathe. Using such a system as opposed to scuba has the benefit of requiring no certification, gives a safe fixed maximum diving depth, and is lightweight and non-polluting. The system is powered by two series-connected 6V 8Ah AGM batteries (a type of deep cycle battery which is sealed and can be used inverted) and gives 1 hour of dive time before needing to be recharged. The problem is how to let the diver know that the battery is low and protect the batteries from being overly discharged. A piezo type warning buzzer could not be used since in a group of divers underwater it would be very difficult to ascertain whose buzzer was sounding, and a warning light would not work since this system would be used in tropical waters in bright daylight at shallow depths. There are commercial PWM (pulse width modulation) solutions available, but they are very expensive and could not give the exact shut down sequence desired – bringing the air pressure down to 90%, 80%, 70%, 60%…and so on over three minutes when the battery voltage gets low. Therefore we made the special low voltage disconnect controller pictured above. 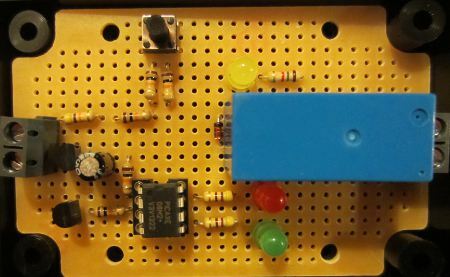 This device constantly monitors the battery voltage, and when it falls and remains below a set threshold (11.2 Volts) the shut down sequence begins. For 20 seconds the pump is off for 1 second then on for 9 seconds, off for 1s then on for 9s. Then for the next 20 seconds the pump is off for 2 seconds on for 8 seconds, off for 2s on for 8s. This process is repeated every 20 seconds increasing the pump off time and therefore reducing the air pressure to the diver so they have to surface, but can do so safely and without panicking. 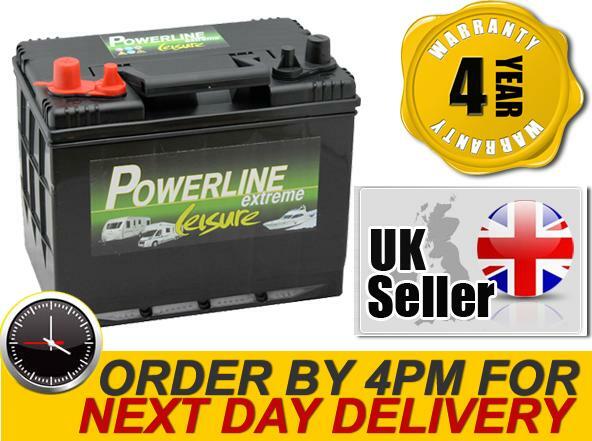 Our recommended offer of the day is this 12V 88Ah deep cycle battery offered in the UK at just £56.95 including delivery (to mainland UK locations south of Glasgow/Edinburgh). As the image above shows, order this battery before 4pm to have it delivered next day, and it comes with a 4 year warranty. This battery has dimensions of 257 x 172 x 220mm and is suitable for solar charging as well as for general leisure and marine usage. 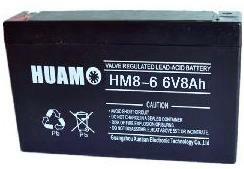 Click here for more information or to buy this 88Ah 12V battery now at this low price.